When Feral and I first started camping on Michigan’s trout season opener, a long time ago, we camped on a bluff overlooking the Pine River in Lake County. We had a friend from childhood join us for the first couple years, he passed away, but I think about him now and then. 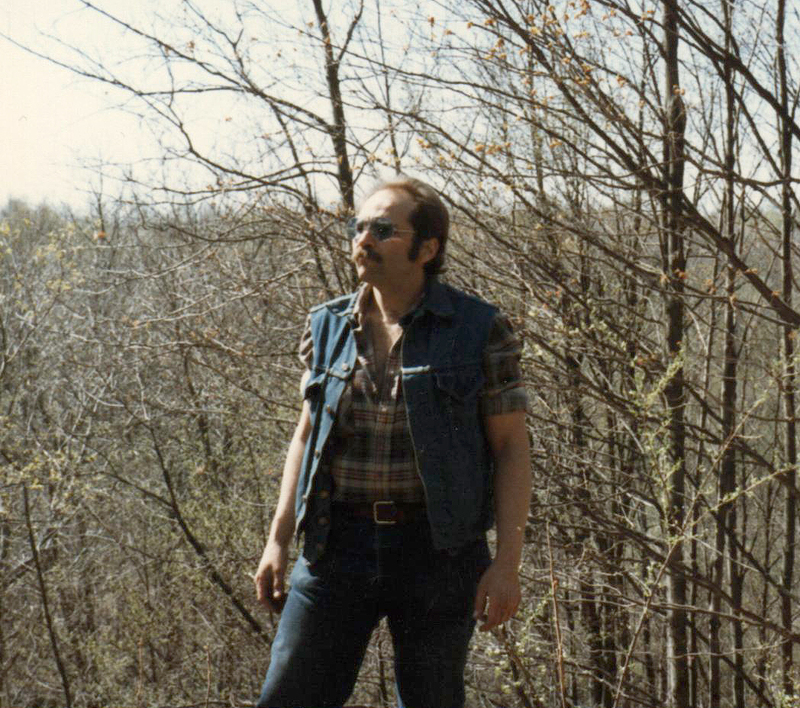 Al loved to hunt and fish. He was a bit of a rogue – never holding on to employment long, made do day-to-day, was generous with whatever he possessed even though it was never much, and was fun to be around. Back then we were very ambitious about opening day and would go down to the river at the strike of midnight to fish. This usually involved some beer, crawlers, and warm clothing including waders. Just down the hill from camp there was a nice bend of deep water that allowed us to toss the crawlers and set up fork sticks, or just fish by feel as the crawlers washed across the sandy bottom. We were not expert wormers but we usually caught a few trout. The bank there had lush grass and we would set a lantern up far enough back from the river to avoid spooking the fish. We could see our shadows against the tall bank opposite us. It was usually cold enough to see our breath, but maybe because of the beer, maybe because of the anticipation of trout, we could forget the cold and concentrate on the goodness of the gathering and joke about anything. Al made do with his fishing equipment. Where Feral and I would try to use just enough hook and sinker to present a crawler to wary trout, Al would launch a concoction of spinners rigged to a home made crawler harness loaded down with metal objects like keys instead of lead. He would usually have a fishing pole best described as used – most likely acquired though some barter the day before the trip. I recall one time in particular where we had a pretty slow night up until Al hooked up on a big fish. If I remember right, his fishing pole was a two piece and on setting the hook it became two pieces with the end of the rod sliding down the monofilament into the stream. Catching trout at night is never pretty, but Al trying to land this fish with half a pole set a new standard. He said the fish was a big and we believed him since only a large fish was likely to move the conglomeration of hardware attached to the end of his line. We all imagined a giant hook-jawed brown trout. We knew the Pine was capable of giving up such monsters and we were ready to witness it. Al was standing on the bank and I don’t recall if he had waders but the next thing we saw was him jumping in the stream and going after the fish. He was able to control the fish with half a pole so the construct of hooks were doing their job. He fought the fish like a man possessed and in no time he managed to pull it near the bank. He reached down and lifted up, to our surprise, a five pound sucker. I am sure Feral had some encouraging, heartfelt words of consolation for Al but those have been long forgotten. The event was the highlight of the trip – but is just one of many stories where Al provided something extra to make a gathering special. RIP Al. You were a true fisherman. 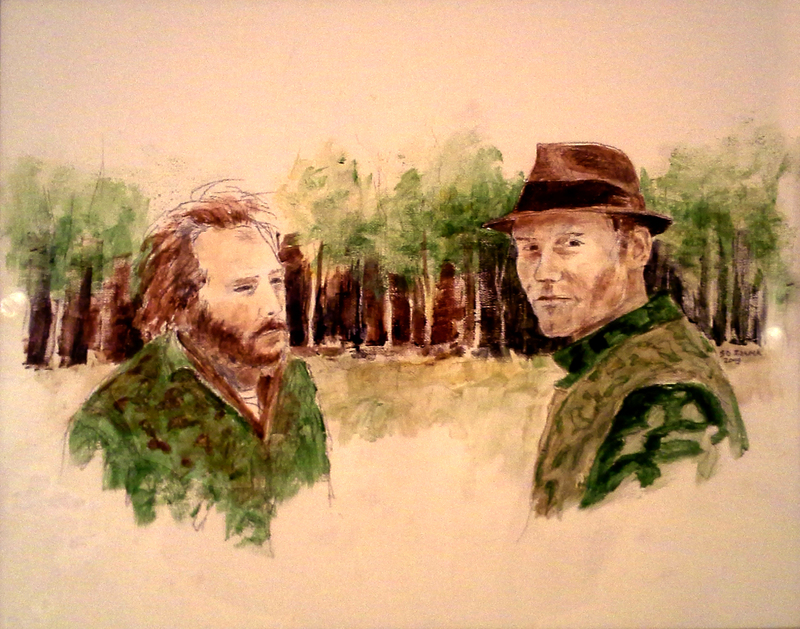 For those who remember Al and his love of the outdoors, here is a painting I did in 2004 of Al and Feral, painted from a photo taken during archery deer season, most likely in the late 70’s. 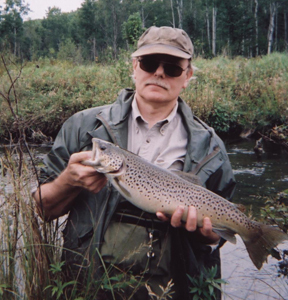 Al was an avid bow hunter as well as fishermen. Those were such fun times! I’d like to have a nickel for every musical instrument Feral has brought to trout camp because I could buy a candy bar. If it has strings attached he has owned one, and that includes banjos, mandolins, violins, ukuleles, acoustic guitars, electric guitars, dobros, steel guitars, classical gut string guitars, and some hybrids like a tiger maple slide guitar. Not to mention harmonicas, a piccolo, a flute, a recorder, and then there was the time he brought up a grand piano on a flat bed trailer. Ok – no piano yet at trout camp, but he has owned one or two. Feral’s owned some vintage instruments including a Fender Duosonic circa 1960s, an unidentified parlor guitar that had the loudest, clear tone I have ever witnessed, and a steel Dobro with a hot lady etched on the back (wow). All of his instruments came with a story and it was always more fun hearing the story than hearing him play. (Just kidding but Feral is a story teller which is a rare breed nowadays. He keeps trout camp a very interesting place to be.) He is also a daring instrumentalist which is more than I can say for myself. So how did I get started on Feral’s instruments? In the picture above there’s an electric guitar I don’t recognize. 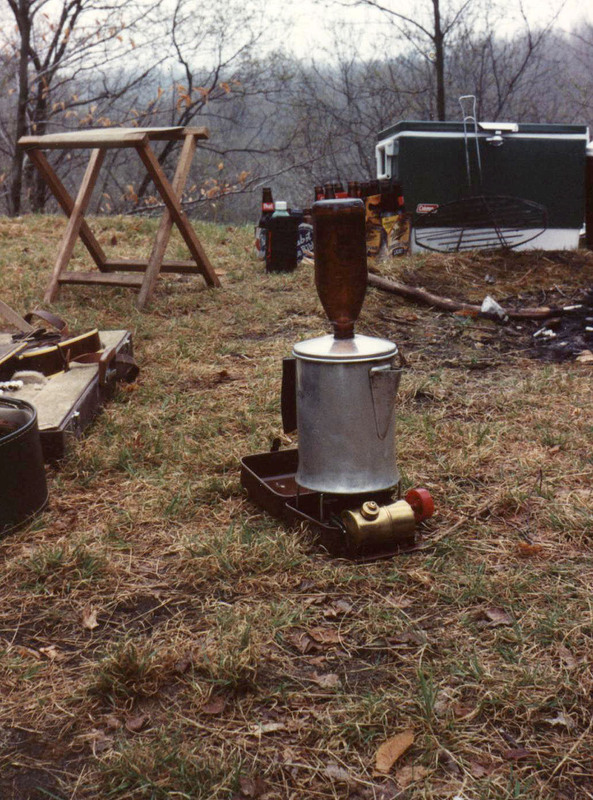 I remember taking the photo one morning when we tried to make coffee but we lost the percolator cap on our coffee pot. The beer bottle did the trick – so there’s my camping tip for the day. At first I thought the guitar was a loaner I had from Jeff DeJager back in the 70’s, a Stratocaster copy with a neck though body that his wife bought him and he didn’t play but loaned to me for some unknown reason. But it doesn’t look like a strat body so I am at a loss. It may be one from Feral’s archive or maybe someone else brought a guitar to camp. Anyway, when I get a nickel for every instrument Feral brought to trout camp I will give the person who identifies the guitar a candy bar.